Window treatments in the kitchen have an especially tough job. They need to be functional, easy to clean, and able to withstand the variety of splatters and odors that come along with cooking. With that list in mind, plus a few more considerations for kitchen windows, here are some tips and recommendations for shades and blind options in the busiest room in your home. Natural sunlight is lovely, but it also brings damaging UV rays that can fade fabrics, damage wood, and dull your finishes. If your kitchen faces the sunny side of the house, solar shades are an ideal choice as they offer UV and glare reduction. In the photo above, you can see solar shades in the Mini Basketweave material, part of the Chilewich Designer Collection. Solar shades are well suited to kitchen windows that look out on a beautiful view and homes with low to no privacy concerns. The sheer nature of solar shades will protect your furnishings by blocking UV rays while still preserving your view and keeping your kitchen filled with light. 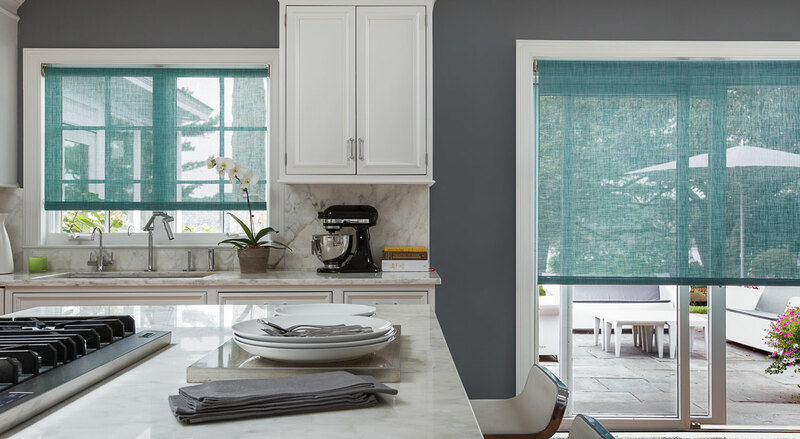 If privacy is a priority for your kitchen, whether it faces a neighbor’s house or looks out onto the street, then roller shades in a blackout material will meet your needs. Blackout roller shades will block light during the day and prevent anyone from seeing into your windows at night. 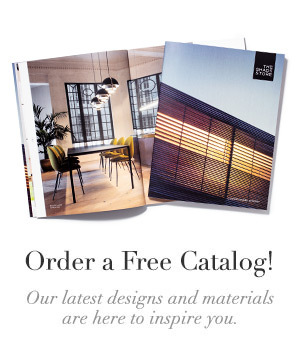 Although blackout shades will by nature appear heavier than a light filtering material like a solar shade, we offer a variety of prints and fabrics to give your room the mood you want. 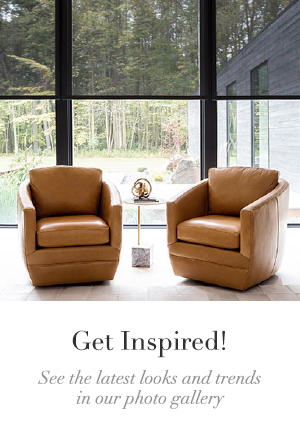 From solids to chevrons to florals, you can dress your windows in a bold or subdued style that matches your décor. Both roller and solar shades are incredibly practical. Choose from two control types: a continuous loop stainless steel chain or cordless, which operates with a gentle push or pull. Their sleek design makes cleaning simple; all they require is a wipe down with a soft cloth. If you’re hesitant about any type of fabric material in your kitchen, try wood blinds. They are durable, provide privacy and are easy to use, and our 60+ stains and finishes mean that you can match your blinds to any style of woodwork and trim. Wood blinds do not absorb odors, making them well suited to the kitchen environment. For a window behind the sink, consider our 2” Faux Wood Blinds. These blinds are handcrafted out of foamwood, making them resistant to moisture and mildew. 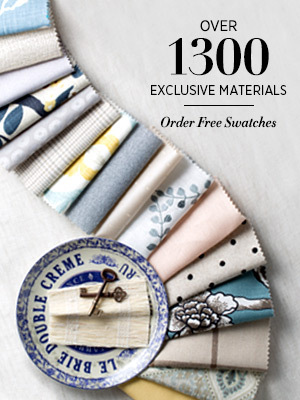 To find the perfect window treatments for your kitchen, order your free swatches or stop into one of our showrooms and talk to a Design Consultant. To see some kitchen window inspiration, take a look at our Amazing Kitchen Windows Pinterest board.